Knowing how long you spend on each job is critical for an indexer (or at least any indexer who hopes one day to raise their prices). The indexing programs will record how much time you spend actually working with a particular file but other time spent on the index can be just as important. Time spent printing proofs, discussing the job with the editor, working up a quote, answering queries from the author about the final index or teaching them how cross-refs work, can all add significantly to the overall time for the job. A really chatty customer can change a lucrative book into a breakeven one. 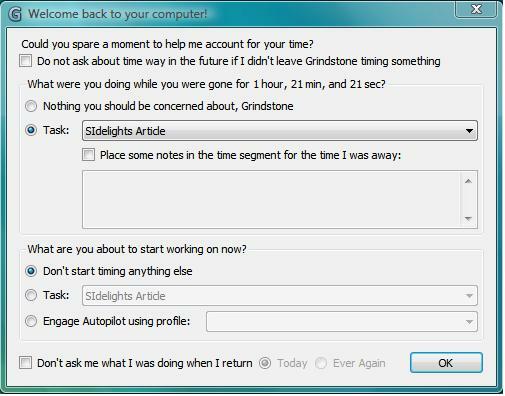 A tool I am now using for tracking time is Grindstone. This is a free program, which runs on all platforms and has some nice features. Installation was automatic and problem free. It is quite usable straight-out-of-the-box, but I found it helpful to group jobs together by client. To do this, first go to the Profile menu and choose “Configure Default”. On the “Custom Fields” tab, click “Create” and add a custom field called “Client”. 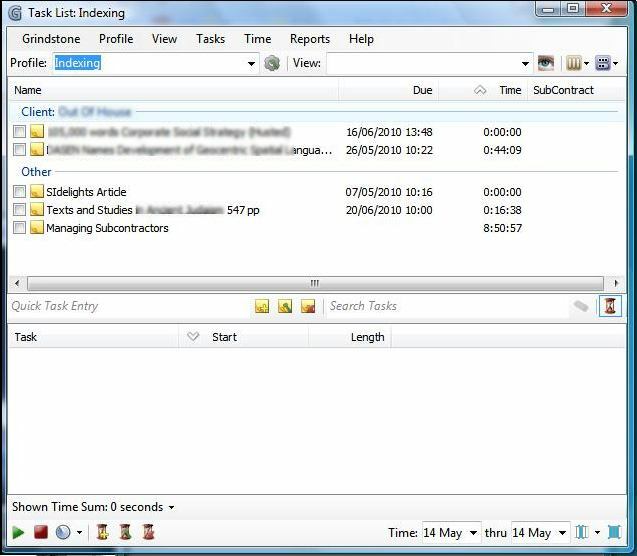 Entering a task is very fast, requiring minimal input of information, just the task name and the due date. We can also click the “Custom Values” tab and enter the client name in the “Client” field we have now created. You can also add notes if you wish, and I decided the easiest thing to do was to paste in the commissioning email from the client, as it has all the detail I need to remind me about the job. Choosing “View” on the main menu we now have “Group Tasks” and can select “Client” and the tasks for each client are grouped together in the window. To track time against a task, select the task and click on the triangle button in the bottom left corner. This brings up a “Stopwatch” which sits unobtrusively at the top of your screen and from where you can also stop and start timing. One really nice feature is that when you stop using your mouse and keyboard for a while, when you return it asks you where you have been! This works really well for interruptions. For example, when working on an index and the postman rings the doorbell delivering proofs for another index. You receive the proofs, check them, punch holes and put them in a folder, and realize that you have no idea how long that took and when you stopped. You return to your computer and Grindstone knows you have been away for exactly 17 minutes and you can log that time to index B and get straight back to index A. Overall Grindstone is easy to use, which means that you do actually record time against tasks and get a much more accurate figure for how much of your time an index really took, and when it comes to deciding which customers to keep and which to release back into the wild, accurate information is essential.